Out of stock. More coming in June! Due to the challenges of the design and the targets we wanted to achieve, this project development and design spanned over more than 5 years. We went back and forth to the drawing board with new ideas refining the design each time to complete this model which is a real engineering achievement. 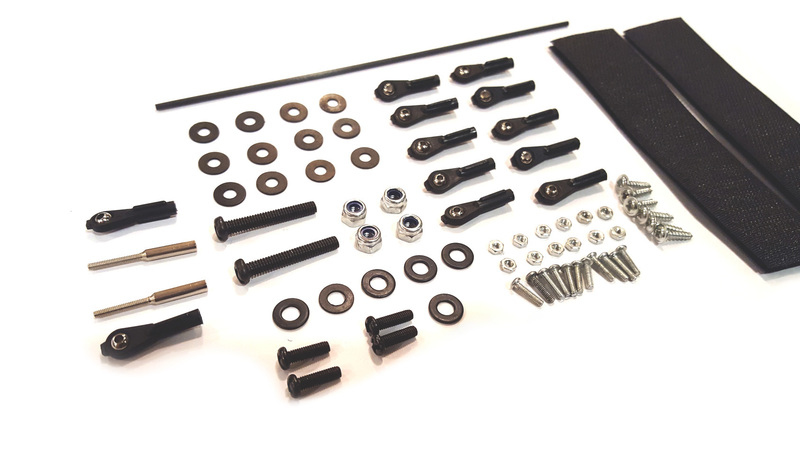 Just a few minutes to assemble at the field, which are easily transportable even in a small car – Shaun developed the IWRS (innovative wing removal system) which requires only two bolts for the bottom wing, and two carbon retaining pins for the top wing. 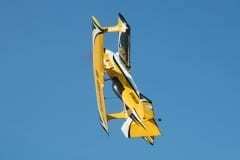 Unbelievable low flying weight for optimal wing loading and flight performance. The AMR 60’s all up weight is about half of competing brands which makes it the lightest bi-plane ever made. Built extremely accurately with pre-set wing incidence (done twice, before and after the covering process). Wings and CF tabs are preinstalled in the factory to ensure excellent alignment and fit. All you need to do is bolt on the wings. 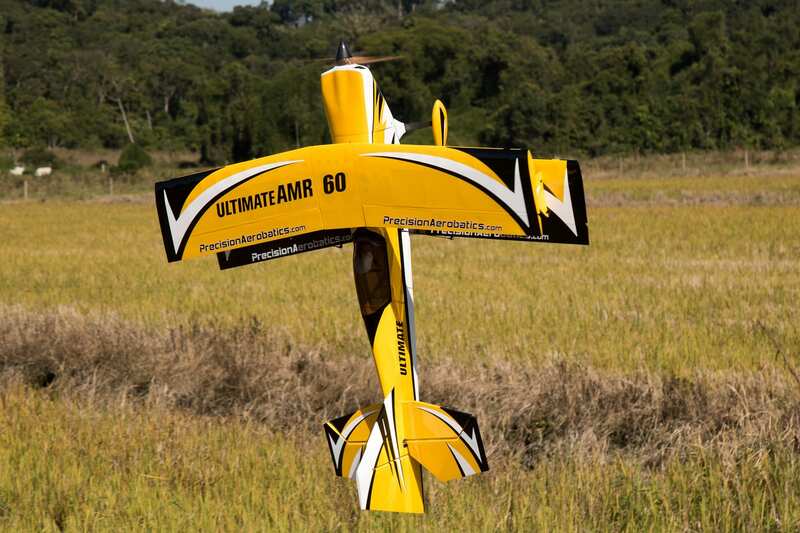 Unmatched flying characteristics – no gyro is needed!! Simple and efficient control surfaces set up using only 4 powerful, yet economical servos. New airfoil specifically designed, tested and refined for this airframe to achieve the performance target. Unique aileron design enhances aerodynamic airflow and control efficiency, complimented by the optional carbon fiber Vortex generators. 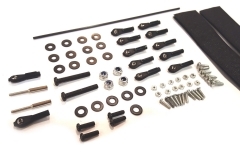 Wing carry jigs and deflection meter are included with the kit. Top quality unique wing bags specifically designed for the AMR 60. It was our target that the assembly will be easy for the modeller and requires only a few evenings. The instruction manual is the most detailed you’ll find and takes you step by step with high quality large images and attention to details that simplify the process (example- CG set up by inserting a fishing line through a designated hole in the cabane struts – no measuring required). No pull-pull on the rudder, we were able to accomplish having the rudder servo on the tail with a direct drive, special oversize carbon fiber pushrod, to provide maximum strength and zero flex for best flight performance. The ailerons are already pre-hinged with the gaps sealed and as such assembling the wing is quick and easy. Elevator/stabilizer hinge slots are pre-cut and ready for you to glue the hinges. Unlike others we don’t offer our team pilots superior gear and sell you cheaper stuff – what you see in our flying videos is what you get! We raised the bar once again making the lightest and most powerful motor in its class! the Thrust 60R with the latest generation RotorKool® system making it lighter than our Thrust 50 yet even more powerful and kool! This motor is so efficient it allows us to power the model with 2200 or 2600mAh packs. We chose to use 2 x 3S packs to allow these packs to be used in our smaller models. We find 3s packs to last longer than 6S due to the better cooling each cell has. It is also a pack that is already owned by most of our customers so investment in a single 6S pack is not needed. 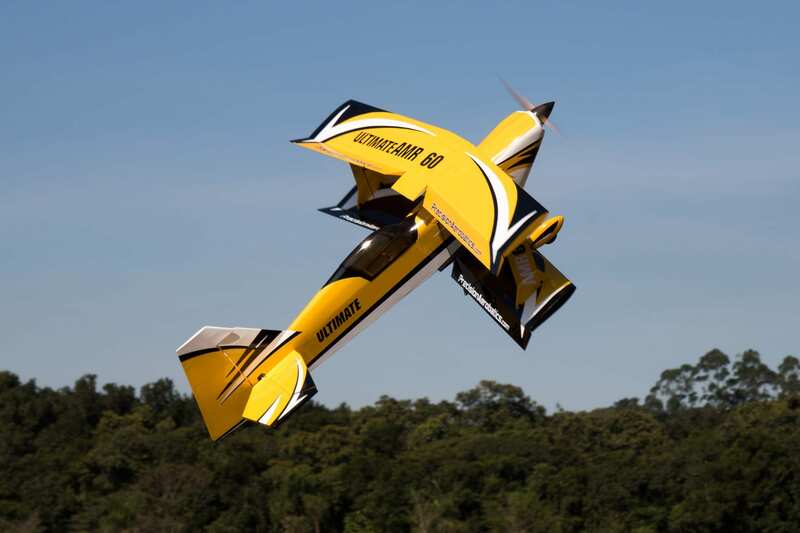 This plane / gear combination is incredibly versatile, with the use of 3 different props, you can completely transform the plane, VOX15x8 for all around freestyle performance, VOX15x10 for extreme high energy aerobatics, and VOX16x7 for all out low and slow 3D. We developed the new NXT-90 High Voltage (HV) servos and with them the new Quantum 70 Pro ESC with powerful (8amp peak) selectable voltage SBEC, which allows you to choose between 6v, 7.4v and 8.0v! These powerful servos are significantly lighter yet offer more torque, and a smaller foot print taking its performance to the next level! The NXT90HV will beat ANY other servo brand in value for money, hands down! Easily accessible battery tray, a common issue with bipes – but not in this one! FiberFusion® engineering at its best, exploiting knowledge from the past 14 years, utilizing the strengths of the fibers within each raw material, with the end result being lighter, stronger, more rigid aircraft that fly like nothing else! No black spraying of components just to trick the eye! No cheap lamination that you’ll now see in so many RC models. There is a LOT of construction engineering and testing work done on each part of the plane. No compromise on smooth flight performance, we sourced the hardware from multiple suppliers worldwide. 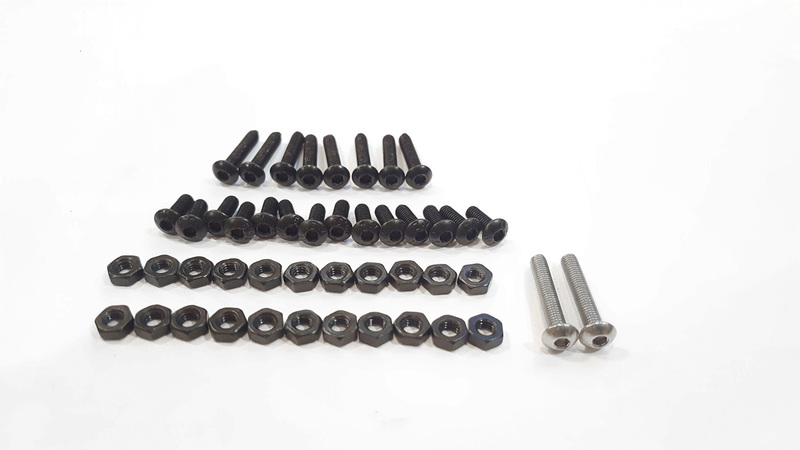 The ball links and couplers from Germany, selected quality anodized socket head cap screws throughout, making the assembly a breeze. 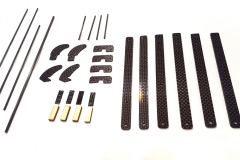 * Top quality high temperature Carbon fiber components are all made in house: from the carbon fiber CNC machined control horns and cabane struts to the landing gear and spinner cone. 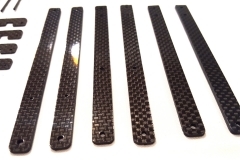 Carbon fiber wing tubes and pushrods as well as the many reinforcement and formers in the structure are all made of the real stuff! 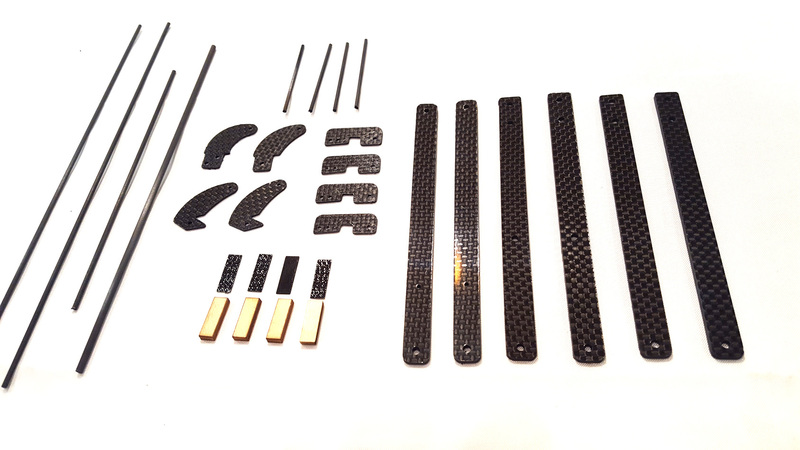 Even our T60R motor X mount is made of CNC machined thick solid carbon fiber plate for extreme rigidity and significant weight reduction. The AMR 60 is built using finest grade material, all cut by state-of-the-art laser and CNC machines and pre-assembled by our skilled PA owned factory staff. Competition grade balsa is selected to ensure consistent quality and density through the entire airframe in each and every airframe. 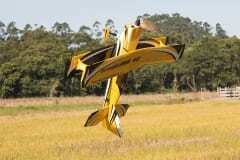 This means no wavy balsa sheeting and full control over the model weight. In order to attain uniform performance for each and every model produced, we build the planes on very precise jigs. Each set of wings are matched individually to each fuselage (this is something most factories don’t do even in giant scales production). No bad flying tendency – This is a one of a kind biplane on the market capable of flying as good as a monoplane and yet offers the unique cool biplane experience and unbeatable stunning in-flight appearance. It also makes a cool wing whistle during high speed passes and KE! It tracks like it’s on rails, high speed knife edge circles, superb precision, incredible high energy maneuvers (crankshafts, pop tops, blenders, this plane loves it all), graceful walking speed low and slow 3D, harriers with no wing rock in any position, super rolling harriers, hovers and torque rolls, this plane does it all! It’s up to you to set the pace. The AMR 60 has quick, crisp response on high rates and will lock into KE at any speed or angle of attack. It’s an excellent tumbling machine able to execute tight spins, violent snaps and crazy waterfalls. 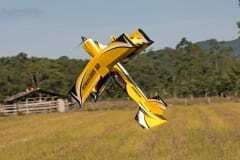 Its fast axial roll is provided by four huge ailerons couple with rigid Fiberfusion® airframe construction. Low rates tames the AMR 60’s personality to smooth and precise. Perfect for precision IMAC or sports style flying. Long fast turns are very accurate and without adverse yaw or loss of attitude and beautiful straight lines. Four point rolls and eight point rolls are simply beautiful. Worried about landing? Forget what you have heard about biplanes. 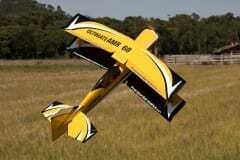 The AMR 60 is THE easiest biplane to land. 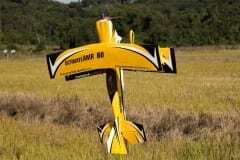 It will practically land itself at any speed without the risk of wing stall. 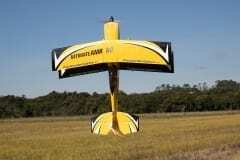 It’s a breeze to perform perfect landings without the need for a fast approach and a long runway. With such a wide flight envelope, whether you are after sport flying, precision or extreme 3D/freestyle this plane is for you! 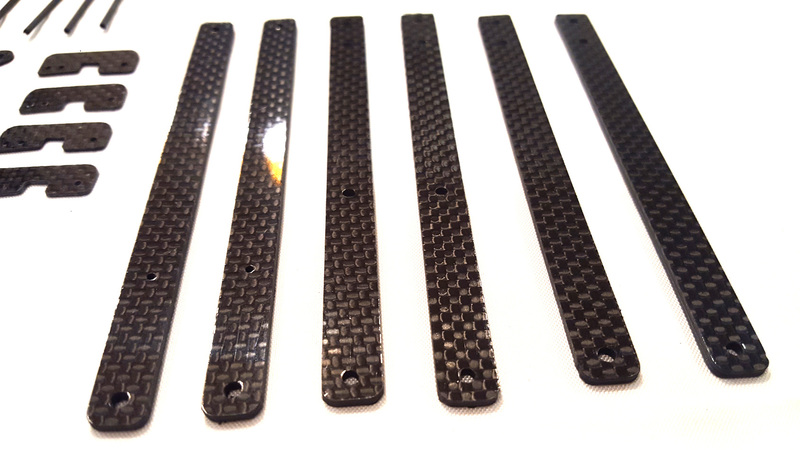 CF CNC machined cabane and struts tabs (pre-installed accurately in the wings). We at PA do not compromise on production cost. We use the finest, carefully selected competition grade balsa which we carefully separate by density in a tight tolerance. 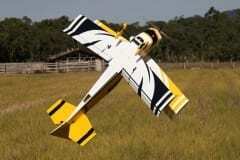 All PA models are assembled with superior adhesives in order to supply our customers with world class airplanes! AMR 60 was designed in mind as a competition class bi plane and NOT a park flyer. 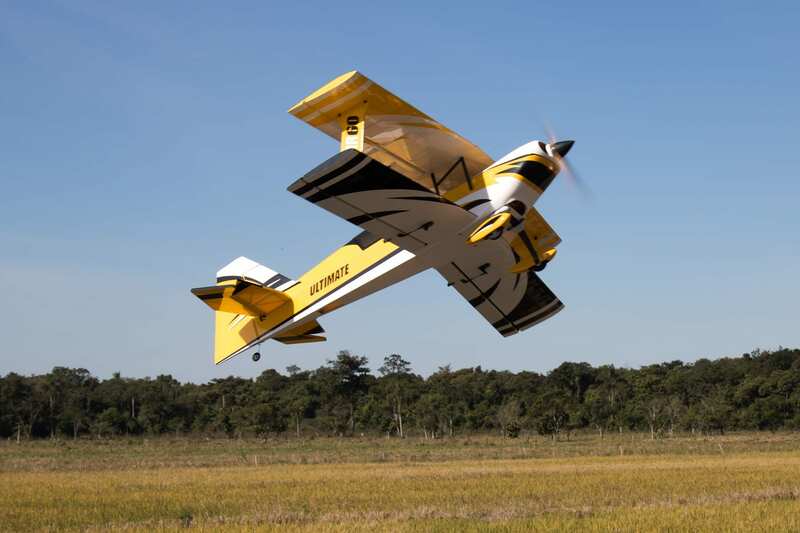 Built strong and precise with high technology engineering, the end result being THE lightest bi-plane ever made in mass production. The flight envelope is incredibly wide from high speed super energy aerobatics to crawling super solid harriers and landings. That allows ANY pilot to confidently fly and enjoy the AMR 60, regardless of their piloting skills. The AMR 60 simply breaks the known barrier most biplanes earned for their high speed landing and rapid stalls. No time or money was spared in the process of the design to the production. 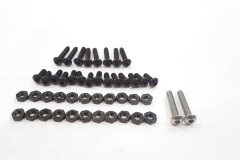 I was extremely picky while selecting every tiny bit whether it was a small nut or bolt, to the hinges of which we tested six different materials to get the best stiffness. I had a lot of challenges during the design which made it my toughest project to date. The battery compartment and the ease of installing and removing the batteries was one. Also the hatch design and ease of installation. The quick installation system for the wing was a big challenge. There’s a lot of difficulty in the production process which makes this plane extremely expensive to produce at the high level we set. The end result is an exceedingly enjoyable plane to assemble, transport and fly. The extremely detailed and user friendly manual took hundreds of hours to complete but the idea is to allow ANYONE to assemble the plane with ease. 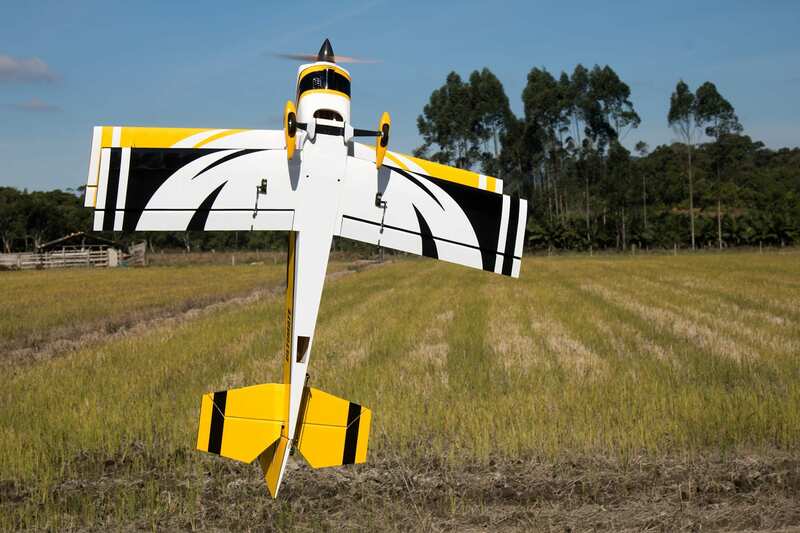 AMR60 can be flown as an excellent sport plane, IMAC practice plane or the most energetic extreme 3D plane. All you need to do is to set up high and low rates (preferably three rate switch). Its large size and vibrant color scheme allow excellent visibility and orientation in flight. 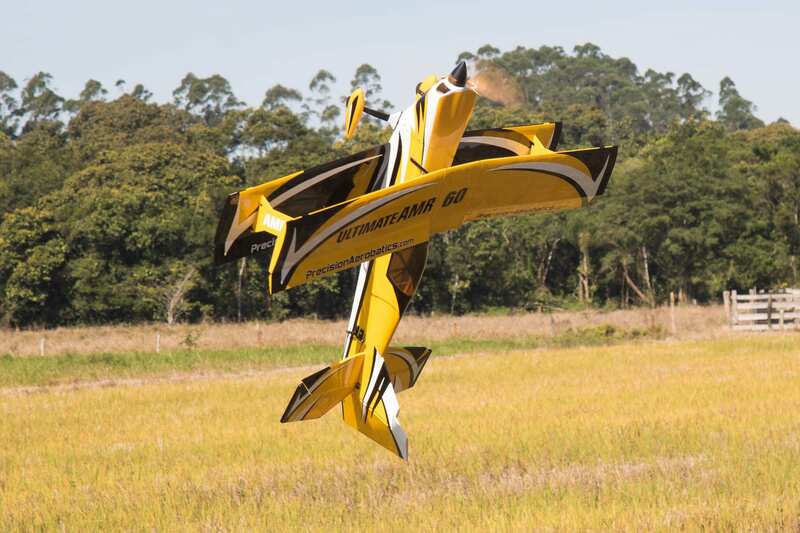 I find it one of the most graceful aerobatics planes to fly, even if you just perform basic aerobatics like rolls and loops. It’s super smooth and precise. I designed the AMR 60 from the ground up ignoring the full scale Ultimate aerodynamic design, however, at the same time I did a HUGE amount of research on all version of the Ultimate ever made and took every tiny bit I liked along my own lines and combined them into a fine looking, highly modified Ultimate. By looking at it, it feels like an Ultimate, however it is far from being scale. It exhibits no KE coupling, extreme maneuverability with unprecedented stall characteristics which will allow the pilot to perform every maneuver they can come up with. 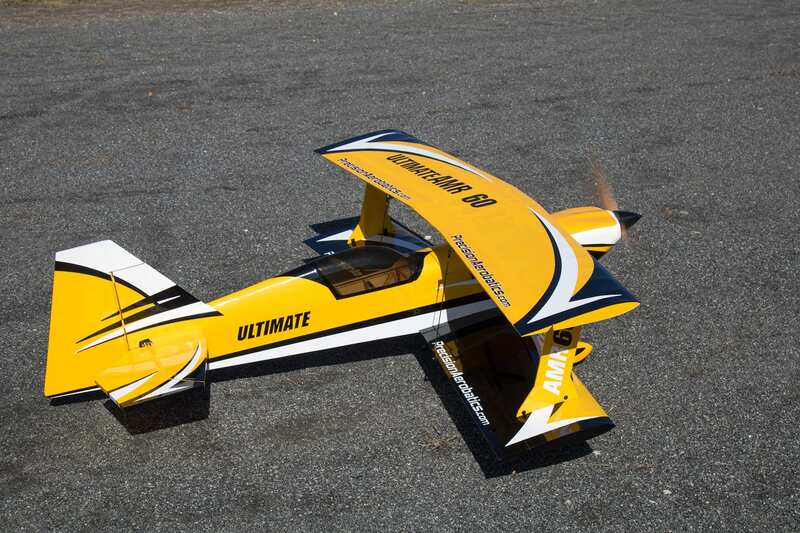 Flying weight (AUW including 2600mAh batteries & spinner): approx 2200g /77.6oz /4.85 lbs !!!! I started assembly on my Ultimate AMR 60 this weekend finally. While there were MANY things that have impressed me with the model, the one thing that amazes me is the covering. There is not a wrinkle to be found anywhere, and it has been sitting for a few weeks. I have some other “high quality” arfs from other manufacturers (the large Carbon Cub from Horizon, the X-Cub from Horizon, just to name 2) and I have literally spent hours getting all the wrinkles out….only to have them re-appear over and over till I finally get them all out. I haven’t found a SINGLE ONE on the Ultimate. I just got back from a successful maiden – 3 flights before dark!! OMG this plane is wonderful..
OMG may be too much elev throw – KE spins were so tight my brain could hardly keep up with it!.. kind of freaky, I had to exit up a bit high as it was so wound up lol’. This plane is an absolute jewel! It feels so incredibly locked in when flying sequence/pattern style flying. Snaps are super predictable: They break and stop super clean and instill absolute confidence in the pilot to be snap happy in any attitude knowing the plane will react predictably. 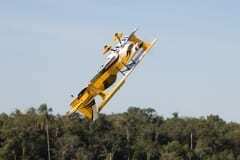 To get a biplane to behave this way is no easy task! I do enjoy 3d but my first love is pattern so holding a line and flying very pattern oriented. The PA Ultimate does this extremely well, point rolls/slow rolls/rolling circles/Cuban eights you name it the Ultimate does it and does it VERY VERY well and of course looks badass while doing so. Overall I think Precision Aerobatics did a great job with the Ultimate. All the parts fit together well, all major structural components were properly aligned from the factory making for an unusually easy biplane build (if you’ve ever built a bipe you know what a pain they can be). There was a minor covering issue with mine but it was probably just a one off flaw, it doesn’t affect flying so its not the end of the world. The plane flies spectacular in all aspects. It can hold a solid line in the sky and only require a flip of the switch and it will become a 3d monster. Awsome job PA! NOW make a 70cc or 120cc and take the market by storm for biplanes! You have a stellar design on your hands, it would be a shame to not expand it. It has a lot of pitch authority which is also nice, I could do a lot of my tumbles which i really like doing. Roll rate is pretty consistent it does good snap rolls, and flew precision pretty well for the little fun plane it is. I was pretty impressed, like i said very easy to fly down low,very stable in harriers and stuff, fun airplane, very fun airplane. But yesterday when i flew it with very little wind, I was super impressed with how well that airplane tracked, how well it did precision, and then of course it went right into beautiful slow 3d, because you know its a nice biplane, it does nice rolling harriers, plenty of rudder and pitch authority, but it doesn’t have too much authority to where it can’t lock back in and fly and track nice lines. I flew the Ultimate this morning. I absolutely love that plane. We now have three of them in our little group. Flew 4 packs on it this AM. This plane is absolutely awesome- high alpha and slow flight are a slow walking pace. I placed the battery a few mm fwd after flying the recommended cg and it’s just perfect. I don’t see a need to go bigger. I have a 3000 pack I’ll try during the week, just to see…. Today I maidened the Ultimate AMR 60. Now, thats a whole new ballgame! Wow, what an amazing airplane! The best yet! And the mounting tech of the wings is just amazing. Goes real quick! 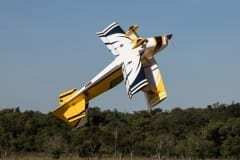 I have been building flying models since 1956. I have built over 15 of your ARF’s some of them several times. Just wanted to say to Shawn that the AMR 60 is one of the best planes you have put out as far as quality control. Not that there was anything wrong with the other ones but this is definitely a step up. I can’t wait to get the finishing instructions on this model. The quality control is unbelievable on the covering and the fit of everything. The only thing I’ve had to do is a sanding stick very lightly on the elevator to fit into the fuselage. Alignment was perfect. Thanks again and I hope you are able to enjoy some of the holiday. Excellent quality as what I’ve come to expect from PA. Assembly was straight forward using their detailed instructions. Love how it handles in the air. Precise and goes/stays where you point it even with turbulence that would knock around other planes of similar weight/size (no stabilization). I normally don’t disassemble planes of this size for transport but their wing removal system is so easy I do it to partly just help keep this beauty looking good. Vox 15×8: Provides excellent power for sport flying, 3D and precision flying, and yet is still very capable of high energy maneuvers. It has a slightly faster top speed compared to the 16×8, but offers an easier to manage throttle response. It also offers longer flight times. Note: Because of the decreased prop diameter, it might provide slightly less prop wash in slow 3D, but it’s light weight gives quick spool up for easy exits out of tumbles, blenders and knife edge spins. Excellent prop for any style of flying. Vox 15×10: For those specifically looking for high speed / high energy flying and is also very good for windy days. This prop’s strong point is high energy tumbles. It is still very good for slow 3D but you can expect the throttle response to be slightly sluggish in slow 3D, while the higher pitch gives an impressive top speed. Vox 16×7: The choice for those looking for the best slow and low 3D performance. It provides maximum prop wash, which means the best control possible during slow 3D and rolling harriers. It is a very good all-around prop, with a slightly slower top speed compared to the other props, but offers excellent 3d stability. It is still very capable of high energy. Please note: The larger diameter creates higher gyroscopic forces, which can make for some really interesting tumbles! Because these 3 propellers really change the way the plane flies, we recommend getting all 3 to determine which one you like best. During our flight testing we kept switching between these 3 props as they are all excellent choices.